Southeast Bottling & Beverage is one of the most comprehensive contract beverage bottling companies in the United States. 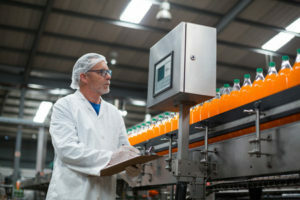 Ready-to-drink manufacturers almost always save money on their beverage bottling costs when they turn to the experienced professionals at Southeast Bottling & Beverage. By turning to a full-service contract bottler, you can significantly reduce your beverage bottling costs, while never sacrificing quality of service. Our new, 76,000 square foot facility was built to cGMP (Current Good Manufacturing Practice) regulations and enables us to facilitate all phases of the bottling process. We have on-site refrigerated storage for ingredients, an air-conditioned warehouse to store your raw ingredients, and five filling rooms to ensure the strictest sanitation controls are met. We also have a separate pharmacy that is enclosed and features an independent HEPA filtration system to further promote quality control during the ever-important ingredient measurement phase of the bottling process. Additionally, our tank boasts a 31,000 gallon capacity, which allows us to perform production runs of all sizes quickly and efficiently. In fact, we also offer trial runs along with our pilot program for those who want to fully test their product in the marketplace prior to committing to a full production run. The less time your product spends in-house and the quicker it lands on store shelves, the better. We gladly serve manufacturers in Texas, South Carolina, North Carolina, Virginia, Louisiana and throughout the US, so contact the experts at Southeast Bottling & Beverage today for more information about our products and services and learn why Southeast Bottling & Beverage is one of the premier contract beverage bottling companies nationwide.